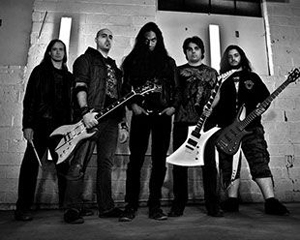 New York metallists MARTYRD continue their rapid rise with the announcement that they have landed a prime opening slot - for a killer bill, comprised of METAL ALLEGIANCE, MARTY FRIEDMAN, and GUS G.
The show will take place on Friday, January 20th (MARTYRD hits the stage at 7:30pm, doors at 7:00pm), at the City National Grove of Anaheim, in Anaheim, California - during NAMM week. "We're totally honored to step up to the legendary Anaheim Grove, and to be sharing the stage again with METAL ALLEGIANCE,” says one of MARTYRD’s two guitarists, Michael Andreas. “Not to mention Marty Friedman and Gus G, who are definitely two of my favorite players. NAMM is a blast, total musical sensory overload from every direction. Tons of people to talk to, new gear to put through its paces, and old friends to party with. It’s like getting lost in a hurricane, I can't wait." The band - whose line-up is rounded out by Mike Kitsos on guitar, Randall Reekstin on drums, Brian Nichols on bass, and vocalist Aaron Pollard - has already played alongside such renowned/respected metal acts as FEAR FACTORY, SOILWORK, SLAYER, ANTHRAX, SUICIDAL TENDENCIES, and MOTORHEAD. And this spring, MARTYRD will be unleashing their latest album, Endless, while the video for one of its standout tracks, “Faceless”, serves as the perfect example of the album’s melodic, heavy, and dark direction, which can be viewed on KNAC.COM right HERE. "The album is really story driven,” Andreas says about Endless. “Both musically and lyrically, every song is part of this big story. Each song stands by itself, but they're all part of a bigger whole. Musically too - you'll be able to listen to the whole album through as a single piece of music. We didn't decide on the name Endless until very late in the recording process."